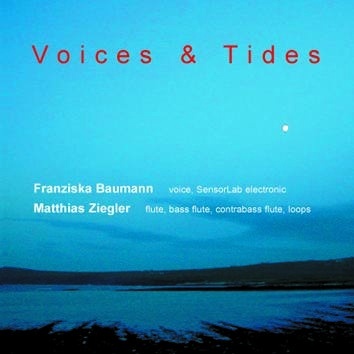 Franziska Baumann - voice & SensorLab electronic, Matthias Ziegler - flute, bass flute, contrabass flute and loops. The clever use of SensorLab makes Franziska's voice totally unique. There is a definite sense of a drama of the creative process which entices the listener into an undreamt-of world of sounds. What makes this duo so special is the density of chamber music, the aural tension, the mutually intuitive reading, call and response, and the confident but playful handling of acoustic, electroacoustic and electronic devices. The voice, the breath and air flow, lips, tongue and oral cavity are used expressively to generate an enormous spectrum of sounds and noises. They practice an unorthodox and extensive handling of their instruments, leave conventions behind and still remain connected to the European musical tradition.